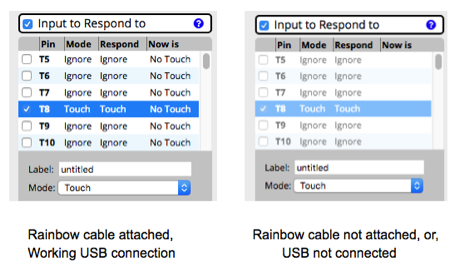 Be aware that when you plug in the touch rainbow cables, or any time you significantly change the arrangement of the touchpoints and their cables, it will probably work better with a re-calibration. The MakerBit calibrates the "no touch" status of everything whenever it powers up or is reset. Try unplugging then re-plug the battery or USB cable to cycle it whenever it doesn't seem to be responding to touches correctly after you have added new touchpoints or cable arrangements. After plugging in the battery or USB cable, wait 10 seconds before touching a sensor or the rainbow cables. This will give the MakerBit time to properly calibrate itself for the "no-touch" condition of the wires and sensors. 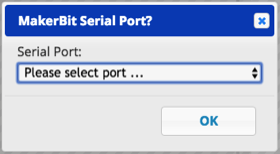 The first thing of course is to make sure that you've selected the serial port connection to the MakerBit. If you have selected the serial port, but the MakerBit app still shows touchpoint pins grayed out, the first thing to check is to make sure the rainbow ribbon cable is plugged into the white box on the MakerBit. When this isn't plugged in, the MakerBit app grays out the touch pin lines. If the LED connected to the MakerBit don't blink when the USB cable is first connected to the computer, or other LEDs that you expect to light up when you touch a touchpoint don't do so, try reversing the legs of the LED in the sockets if you're using the individually connected LEDs. 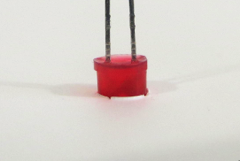 For the individually connected LEDs, the short leg of the LED should be inserted into the socket with the small triangle. 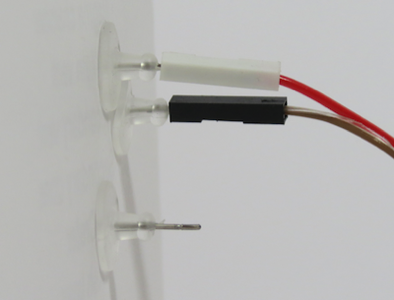 When viewed from the side where you can see the metal, that will always be the socket on the left, connected to the brown, orange, green purple, or white wire of the pair of wires going to your LED. In general, your project will look nicer if you make the hole from the front of the board and then insert the LED from the back side of the cardboard or foamcore of your project. The wires are also less likely to get crossed when they lay flat on the board, neatly folded over from the back of the LED. To aid you in knowing which media list items are being responded to at any given moment, the media list item will be highlighted in green when it is active. If the configuration window is open, and the MakerBit app is responding to an input condition, rather than just being at that URL in the browser at that moment, then the “Input to Respond to” box will also be highlighted in green. Next to the Input to Respond to, Arriving at Content, and Leaving Content boxes are “?” icons that when clicked on will take you online help pages. At the top of the media list window is an oval that displays either “Now: Active” or “Now: Idle”. This is automatically changed to “Idle” when you don’t have an active USB serial communication established. You can also manually set it to Idle so as to pause the automatic responding to inputs. In the configuration windows, the MakerBit Media Linker displays the real-time status of all inputs and outputs. This is very handy for knowing exactly what is going on at that moment in your system. It’s also handy if you’ve hooked up your sensors, but don’t remember which sensors have which identifying numbers. To work that out, just touch each sensor on your model while watching the real-time display of sensor inputs. Check the wires of the LEDS, photocells, or any other component to make sure that they're not crossed or twisted together. If it still doesn’t blink, check to make sure that the micro:bit board is plugged into the MakerBit shield with the 5x5 LEDs of the micro:bit facing you, and also try unplugging then reconnecting the USB cable. There may also be a temporary problem with the USB (serial) communications between the MakerBit Media Linker and the MakerBit (micro:bit) hardware . • Save your media list. Name it before saving if it's "untitled". If nothing seems to work to have the touch sensors display properly, and if you happen to have a 2nd MakerBit board, try plugging the 2nd MakerBit into the same micro:bit as the first, so as to exchange the boards, and see if the 2nd MakerBit board works in place of the 1st. If so, the touch sense chip on the MakerBit board may be faulty. It's rare, and the boards are all tested at the time of manufacture, but after-production failures do sometimes occur. If that seems to be the case, please contact us for a replacement. Note to Windows Users: We have seen that it matters *which* USB port on a laptop you use. If the "Now is:" column is blank, try switching the MakerBit USB cable to the other USB port on your Windows laptop. Google Drive videos must be set up as “shared” set to “anyone with link can view”. This is still semi-private, but it’s required for the MakerBit Media Linker to be able to access the video. IMPORTANT: If you are in a school environment where the default sharing is "only those at <your school network> can view", use the "more" option in sharing to set sharing to "anyone with the link can view". This is necessary so that the MakerBit Media Linker can play back the videos. Your videos are still private in the sense that you haven't actually shared the link with anyone if you don't want to. This just allows the MakerBit app to access the video. Note that only .mp4 videos less than 25mb in size can be played back by the MakerBit Media Linker. If you upload other video file types to your Google Drive, for example .mov files from an iPhone or Mac, they will have to be converted to .mp4 to play back in the MakerBit app. To convert a video from .mov or other format to .mp4, one way is to upload it to YouTube (you'll probably want to set privacy to 'private' or 'unlisted'), and then use the "Download as .mp4" option in Studio Creator. Another Google playback problem you may encounter is "Unable to play this video at this time. The number of allowed playbacks has been exceeded. Please try again later. ", particularly when you are first creating a media list and have been playing a particular video many, many times while experimenting to get just the times you like. The online pages here are here to provide you with suggestions that we hope are helpful to you in the creation of your interactive maker projects. Click on the links below to jump to particular suggestions and problem-solving tips. How can I make better names for the media list items? When you set the serial port with the Settings menu, in the list you should see a choice for where the MakerBit is connected. On Mac, this will usually be something like "dev/tty.usbmodem1411", on Windows "COM7", and on Chromebooks, "dev/ttyACM0". For Chromebooks in a school setting, it may be necessary for your system administrator to grant permissions for your device to access the MakerBit using the USB port. 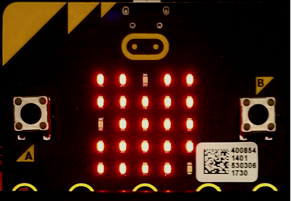 Also, check to see if there is an LED light that you can see on the micro:bit. If you don't see a light, it's possible that the board isn't getting power from the USB cable. If you have a second MakerBit available, try plugging it into the same machine and see if it shows up. If the 2nd one tested shows up in the list, but the first one doesn't, it's possible that there is a failure of the USB controller on the micro:bit. 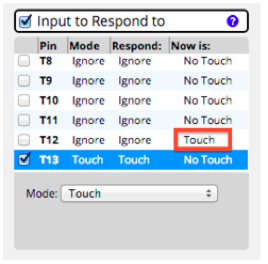 For interacting with touch sensors, with or without the computer, you will want to have installed the MakerBit program. This program is used in the MakerBit tutorial and pretty much any project that you do with the MakerBit aside from special programs that you might create and upload on your own with other programming tools. Touch each sensor in turn, 5 through 16, if you are using all of them. When you touch each sensor, the matching LED number should light up. 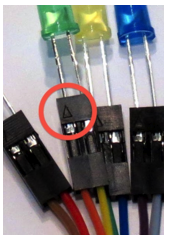 If an individually connected LED doesn't light up, check that the short leg of the LED is inserted in the socket with the triangle. Also, occasionally LEDs do "burn out" or just don't work, so try another LED if one isn't lighting up when the sensor for that LED is touched. If an LED doesn't turn off at the end of a video, or when you change web-pages, make sure that the "End of Media" checkbox is checked, and that the correct LED is set to "LOW" in your media list item. You can view the Start/End window for existing media list items by clicking on the gear icon. 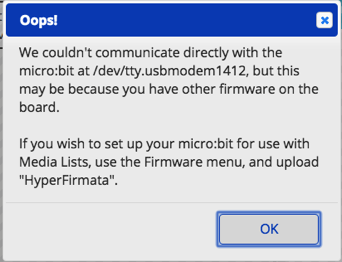 If you get this alert when trying to set the serial port for the MakerBit, it may be because you have uploaded custom sketches (firmware) to the MakerBit (BBC micro:bit), or are getting this message for some unknown reason, use the following steps to totally reset both your USB connection and the firmware on the MakerBit. USB connection before opening the MakerBit app. 3. 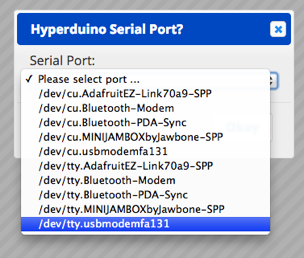 In the Settings menu, choose "serial port..."
4. In the Firmware menu, click on the HyperFirmata image to start the download. With the touch sensors and rainbow cable, the main thing to recognize is that if you're holding the rainbow cable in your hands, that can be picked up as a "touch". Also, when the cable is just laying on the table, it's easy for the touch sensors to touch one another. When testing the LEDs and touchpoints "loose" on a table hold the touch rainbow cable lightly by the edges, and look to see that the touchpoints are not in contact with one another. Another thing that can cause erratic behavior is a low voltage on the battery case for the microbit. You can also help the touch sensors "know" what the starting (not touched) condition should be by unplugging and re-plugging the battery when you're testing things not connected to the computer. Whenever the MakerBit powers up by being connected with a USB cable or battery, it calibrates itself assuming that no sensors are being touched during that start up process. Once the touch sensors are in a project, neither of those are a factor, and keeping those things in mind before the touch sensors are in a project will avoid erratic responses. 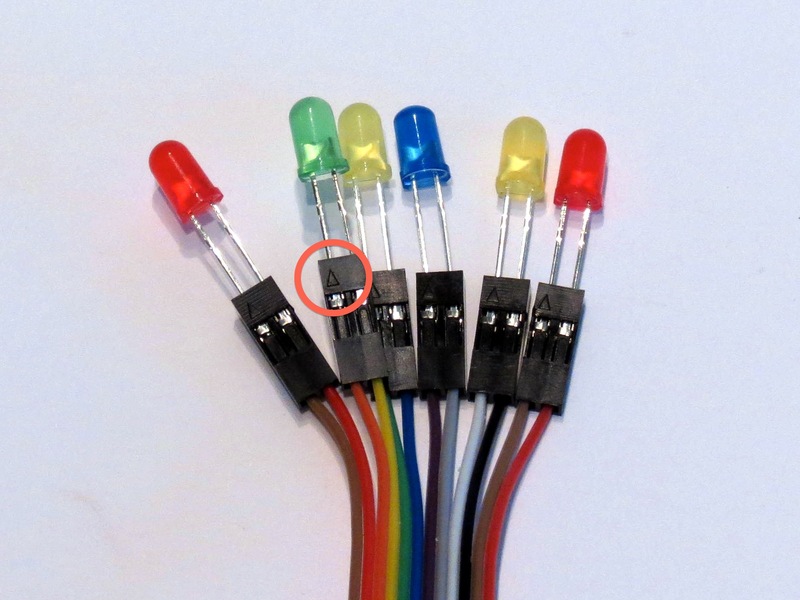 If it seems that some of the pixels of the built-in LED of the micro:bit aren't lighting up when connected to the MakerBit, it could be because the blue trimmers for A3 and A4 aren't turned fully clockwise. 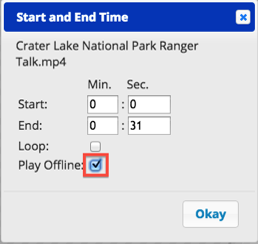 If you get this alert when trying to add a YouTube video, it is because there is more than one (or none at all) YouTube videos displayed in the web-view window of the MakerBit Media Linker. To use this feature, bring up the display of a single YouTube video in the web-view window, and then click on the "+" button and the YouTube option. However, if it looks like you have configured the START and END times correctly for both the video and the LED, the problem may just be that the MakerBit Media Linker is not communicating with the MakerBit via the USB connection. In that case, use the reset procedure to save your media list, quit the app, unplug/re-plug the USB, reopen the app, and re-open your media list. Which wires/sockets are which LED or Touch Sensor numbers? There are labels on the MakerBit board itself, but all the wires count right-to-left, and the LED2 (closest to the middle of the board) and the TOUCH cable (gray) always have 16 on the left and 11 on the right. 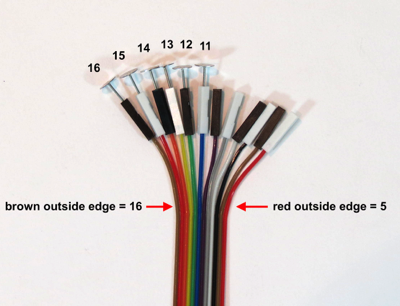 Once the cable has flipped around somewhat it might seem that you can no longer tell left from right, but if you look at the rainbow cable, you will notice that the "left" (pin 16) always has brown on the outside edge of the cable, and "right" is always red on the outside edge. For the rainbow cable connected to the box labeled LED1 (pins 5-10 for LEDs), brown on the outside is always LED 10 and red on the outside is LED 5. 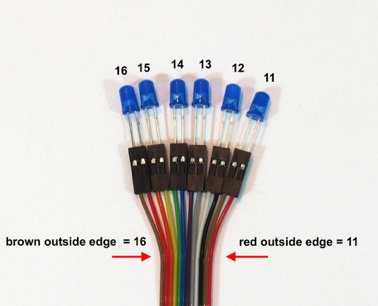 For the rainbow cable connected to the box labeled LED2 (pins 11-16 for LEDs), brown on the outside is always LED 16 and red on the outside is LED 11. The LED inputs are connected to various pins of the micro:bit, including the analog inputs, and the blue trimmers become part of these connections when the micro:bit it plugged into the MakerBit board. Just turn the A3 and A4 trimmers fully clockwise, and the LED pixels with light up as expected. 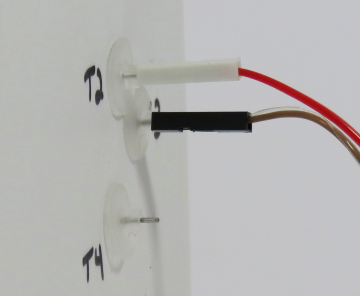 The silicone earring backs are used to secure the posts of the touchpoints in whatever project material you are using. However, the thicknesses of the material for cardstock, bristol board, cardboard and foamcore are different, ranging from 0.25mm for cardstock to 4.6mm for foamcore. These post backs were specifically chosen for their ability to be easily trimmed down with scissors to accomodate the thickness of the project material, while still leaving enough of the post exposed for a good connection to the touch sensor cable sockets. When you add a media list item, the name of the item defaults to whatever the name of the webpage or video file was. It's even handy to include the touchpoint and LED numbers in the name.